Blue limestone. Irish natural stone. Ireland and landscape. Geology. All over the world, the colour green is associated with Ireland. There's the 'wearing of the green', cute shamrock logos, the green of the flag and even the bizarre suits of the leprauchans. Known as the Emerald Isle, the country is painted, so the tourist literature says, in forty shades of green. But Mother Nature is playing a little game here. Is the Emerald Isle a misnomer? Ireland's landscape may look green but you only have to dig a little way beneath its lush verdant carpet to discover that the dominant colour of Ireland is blue rather than green. 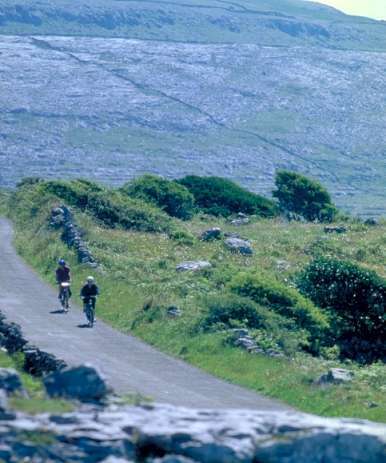 This is the famous Irish blue limestone; it is found in parts of every county of Ireland except Wicklow and Antrim and it lies under more than half of the island. A geology expert will explain that this blue limestone is a sedimentary rock, composed of calcium carbonate and formed in the Carboniferous region. In other words, it was created about 370 million years ago, give or take a few million years, from soft lime muds under warm waters. Fragments of shells, coral and sea plants were washed in by waves and became trapped in the mud. Manoeuvering stone has always been difficult and dangerous. At that time, Ireland did not have the rolling landscape we are familiar with today. It was part of a shallow sea between two land masses and about 5 degrees north of the equator. It probably rained a little less in those days! Since then, Earth has experienced radical change. The continents shifted and the land beneath the shallow sea moved northwards. The dinosaurs came and went. So did the Ice Age. Then the early mammals arrived. By the time the island that was to become Ireland was lifted from the sea, the mud had evolved into a tough, finely-grained limestone just below its surface. Having taken so many millions of years to form, it has taken only a couple of thousand years to prove the durability of limestone as a building material. Local limestone was often used during the Neolithic and early Bronze ages to construct elaborate burial cairns and the more sophisticated Iron Age man discovered it was ideal for carving and artwork. The Celts developed this further with many of their elaborately patterned crosses. Old Leighlin Quarry is 24 'beds' deep. It's been in use for over 1000 years. By the 12th century, the size and scale of building had moved on and Irish blue limestone was the material of choice for castles and monasteries. Jerpoint Abbey in co Kilkenny is an excellent example of how construction techniques and the stonemasons art were developing in the early medieval period. By working the stone in different ways, limestone can provide colours that range from deep blue/black to a subtle blue/grey, and surface textures can range from silky smooth to harsh. In the hands of a skilled architect, designer or stonemason, the stone's potential is unlimited. This outstanding Cistercian abbey, founded in 1158, has impressive Romanesque details, a remarkable sculptured cloister arcade adorned with carvings and a numerous carved tombs. About 20 miles away, just over the border in co Carlow, are two blue limestone delights. The first is St Laserain's Cathedral in Old Leighlin. It was built about a century later than Jerpoint and has some wonderful limestone details, both inside and outside. Nearby is one of the most photogenic villages of the southeast: Leighlinbridge. Dromoland Castle is now a hotel. The narrow limestone bridge that lent the place its name spans the River Barrow with the help of six arches and is the oldest bridge still in use in Ireland. It was built in 1320. The architects and builders responsible for these two gems didnt have far to look for their building material. This is the very heart of blue limestone country and the stone was cut from the ground at the nearby Old Leighlin quarry, an operation which continues to supply its Carlow Blue limestone today. 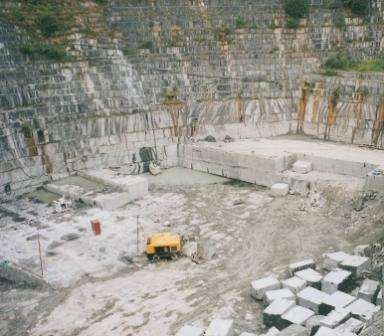 Within a twenty mile radius are two more major blue limestone suppliers: Kilkenny quarry and Threecastles quarry. These three quarries together export about 15 container loads of material every week to Belgium, Germany and the Netherlands. Some also goes to the UK and the USA. Among the most recent high-profile international projects to use Irish blue limestone are the Hunger Memorial in New York, Throne Square in Brussels, and the landscape and ampitheatre below Londons headlamp-shaped City Hall. Back in the medieval period, however, limestone didnt usually travel too far. Heavy and bulky, it was expensive to transport so it remained the preserve of the rich and influential. 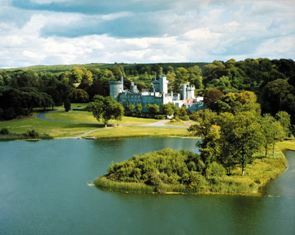 Dromoland Castle (now a hotel) in co Clare and St Canices Cathedral in Kilkenny, date from this era. 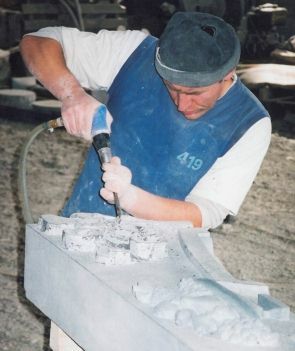 Today's stonemasons use specialised tools. Elevated through contact with the aristocracy and ecclesiastical authorities, the stonemason rose in status and his role was recognised in 1410 when the Stonecutters Guild of Ireland was granted its charter. Some 400 years later, limestones use had become more widespread. Brick was popular but most villages with any outcrop of limestone had its own quarry supplying stone for the local populations simple stone dwellings. The uniformity of the stone, and the way it can be split into thin slabs of consistent thickness, made it relatively easy to work..
Having taken many millions of years to form, it has taken only a couple of thousand years to prove the durability of Irish limestone as a building material. Although the traditional skills of the Irish stonemason continued into the 20th century, they were often restricted to the carving and lettering of gravestones. 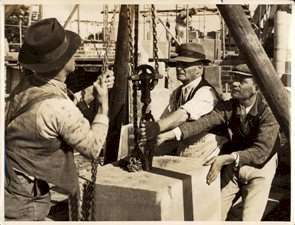 The extraction and processing of limestone was labour intensive and expensive, in contrast to concrete which was gaining popularity. But during the latter half of the century, the Irish limestone industry witnessed a renaissance. The introduction of commercially viable, diamond-based cutting equipment revolutionised the extraction and processing of limestone and Irelands stone industry was quick to embrace the advanced technology. By working the stone in different ways, limestone can provide colours that range from deep blue/black to a subtle blue/grey, and surface textures can range from silky smooth to harsh. In the hands of a skilled architect, designer or stonemason, the stones potential is unlimited. 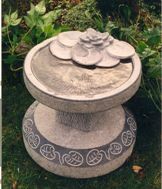 Stone craftsmen can not only produce quality building materials and memorials, they can also smooth and shape this seemingly heavy and solid material into delicate bowls, platters, bird baths, and sundials. Such objects are beautiful to look at but they promise more than just aesthetic pleasure because handling the smooth, cool stone is, quite literally, a way of touching the blue heart of Ireland. This feature was originally published in Visitor Magazine. Celtic high crosses are often cut from Irish blue limestone. More articles and information about Ireland. From Ireland landscape to Irish Genealogy Toolkit Home.